PIE has an pH calibrator to fit your needs from the PIE 235 Voltage Calibrator to the advanced multifunction calibrator with troubleshooting capabilities of the PIE 830. Have you had issues in the past where you are unable to determine if a pH instrument is malfunctioning or if there is a problem with a pH probe? Our pH calibrators can help you find the real problem and get a better calibration than buffer solutions alone. pH calibration is supposed to be simple. Don’t you just have to place the probe into buffer solutions and tweak them in? Many technicians get frustrated when there is a problem with pH sensors and instruments not reading correctly. 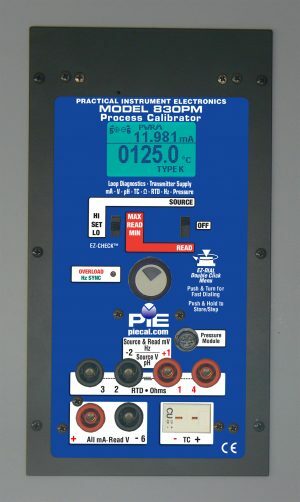 A PIE calibrator with pH simulation can speed up the troubleshooting and adjustment of pH transmitters and analyzers. They source from 0.000 to 14.000 pH @ 25°C (77°F) corresponding to +414.12 to -414.12 mV. This is the most accurate method of checking the performance and gives you confidence that the instrument is working properly. 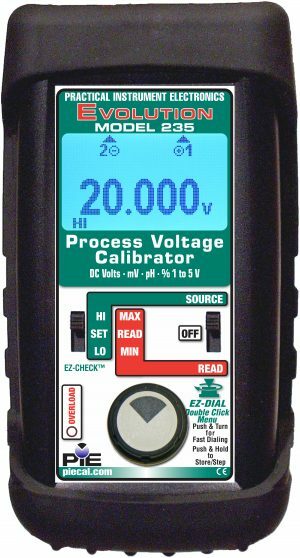 With the 235 you can check, calibrate and measure all your voltage, millivolt and pH signal instruments in your plant. 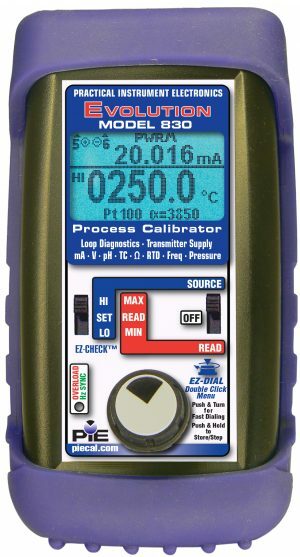 Source -500.00 to 999.00 mV, 1.000 to 5.000 V, -25.00 to +125.00% of 1 to 5 V; 0.000 to 20.000 V. This is PIE’s most economical pH calibrator. The PIE 820-ELITE is a single channel multifunction calibrator that sources and reads milliamps, volts, thermocouple, ohms, RTDs and frequency process signals with high accuracy & resolution. It can also simulate pH and measure pressure with optional pressure modules. Advanced troubleshooting features include detection uncontrolled current in 4 to 20 milliamps loops, broken wires on RTD sensors. The PIE 830 is a dual channel multifunction calibrator that sources and reads milliamps, volts, thermocouple, ohms, RTDs and frequency process signals with high accuracy & resolution. The dual display lets you perform standalone calibration of temperature, frequency, pH and pressure transmitters using the built-in 24V loop power supply. It can also simulate pH and measure pressure with optional pressure modules. Advanced troubleshooting features include detection uncontrolled current in 4 to 20 milliamps loops, broken wires on RTD sensors, and simultaneously displaying the loop current, power supply voltage, and load resistance in a live 4 to 20 milliamp loop. The PIE 850 is a dual channel multifunction calibrator specifically designed for nuclear power plants (or other facilities using older technology) with 10 to 50 milliamp loops. It sources and reads milliamps, volts, thermocouple, ohms, RTDs and frequency process signals with high accuracy & resolution. The dual display lets you perform standalone calibration of temperature, frequency, pH and pressure transmitters using the built-in 24V loop power supply. It can also simulate pH and measure pressure with optional pressure modules. Advanced troubleshooting features include detection uncontrolled current in 4 to 20 milliamps loops, broken wires on RTD sensors. Click here to learn how to use PIE’s handy pH calibrator function to troubleshoot pH calibration issues.